Installation of Ursula von Rydingsvard's exhibition The Contour of Feeling. On the left wall are her works SCRATCH II and COŚ, in the foreground is PODERWAĆ. 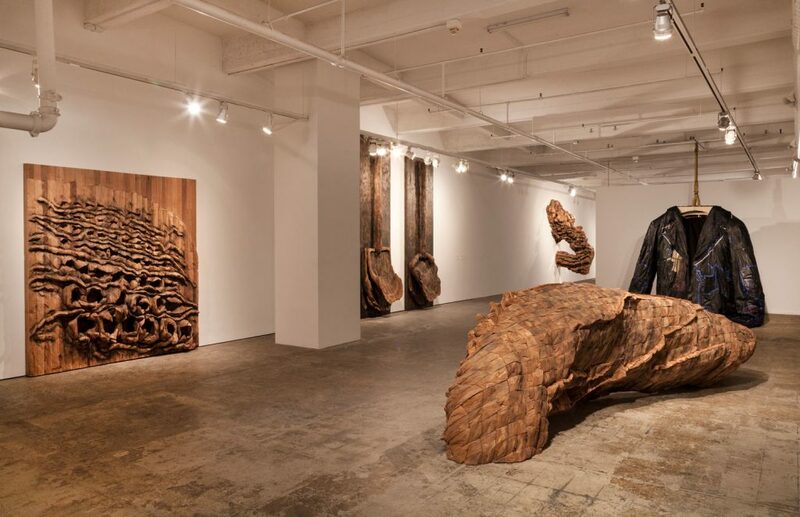 “Without vulnerability, I don’t know where humans would be,” expresses artist Ursula von Rydingsvard in her usual soft spoken but affirmative tone, while walking through her massive Bushwick work space on a sunny May afternoon. Despite the Brooklyn studio’s unusually generous size, the affluent sculptor notes that she could always use higher ceilings, mindful of the towering heights her grandiose sculptures reach. Their immense scales and tenacious cedar or bronze surfaces may convey pure resilience and fortitude, but vulnerability is crucial for von Rydingsvard, who drifted across several refugee camps with her six siblings and Polish and Ukrainian parents in Nazi-occupied Germany until settling in Connecticut as a child. “People who are creative are loaded with [vulnerability],” she adds, “strength and vulnerability are never enemies.” This harmony between perseverance and transience is perfectly evident in the seventy-six-year-old’s decades-long practice, which is being celebrated this year with several exhibitions. 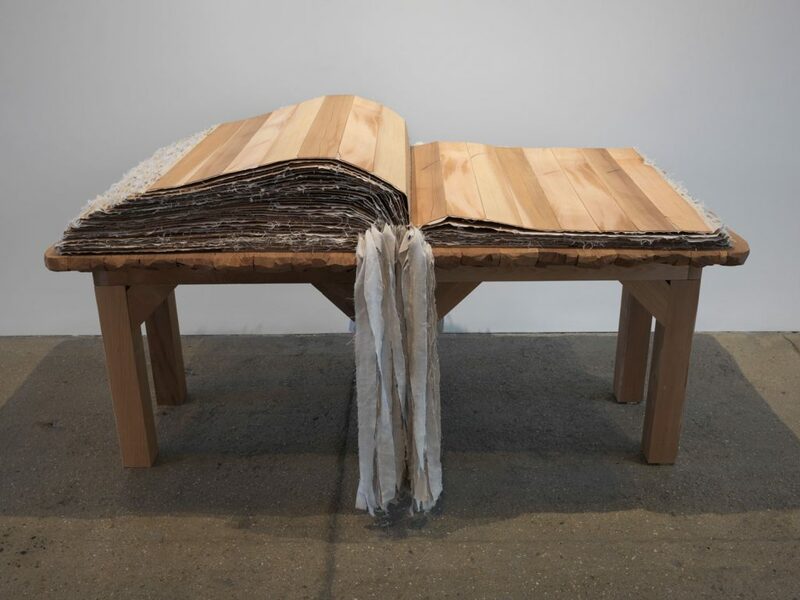 In New York, the artist’s long-term gallery Galerie Lelong & Co. recently presented “TORN,” an exhibition of new sculptures, primarily in cedar, alongside a few experiments with resin, bronze, and linen. 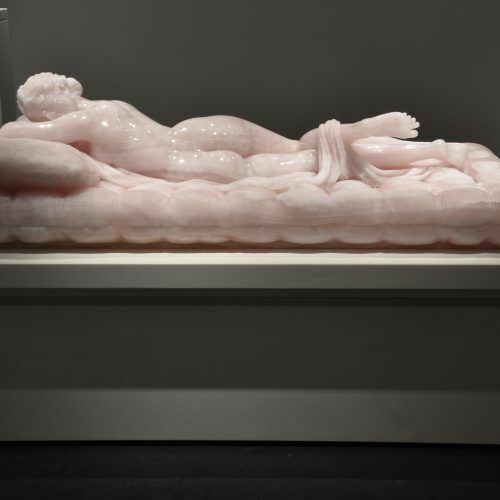 The equally biomorphic and poetic formations are independently dispersed across the space to allow intimate encounters for viewers, while shrouding the Chelsea gallery’s spacious interior with their otherworldly auras. They protrude from the wall akin to a gigantic fungus in DWA (2017) and NESTER (2016), while Roaming Rudia (2017) blossoms from the floor not unlike an aged tree with years’ of burden on its body. 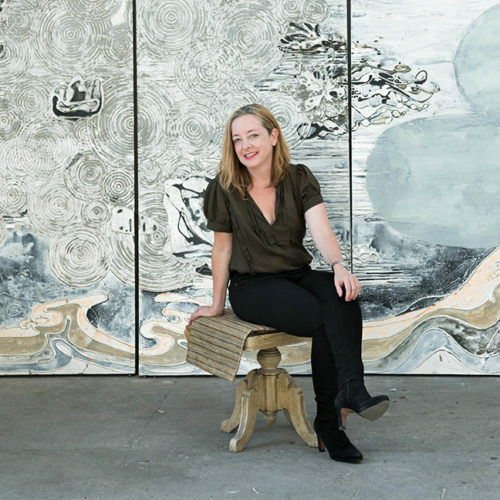 Ursula von Rydingsvard, DWA, 2017. 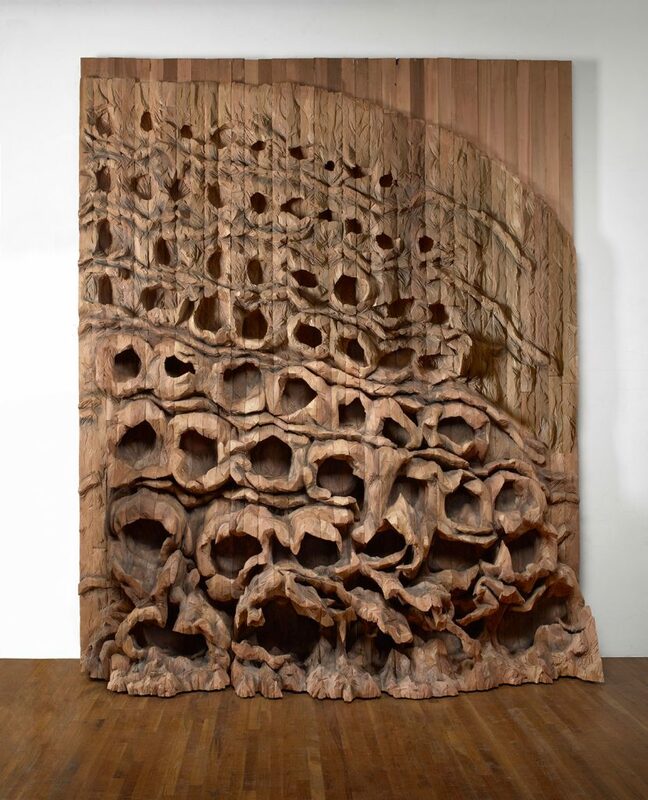 Photo: Courtesy of Ursula von Rydingsvard and Galerie Lelong & Co. The artist’s robust sculptures encapsulate ardency in addition to poise with their tumultuous surfaces that replicate organic formations on soil to veil their precise process, which starts simply with a pencil. Drawing lines on life-size stacks of glue-held wooden blocks with a pencil, von Rydingsvard marks a mental map of her subconsciousness on cedar, letting the mysterious correlation between her hand and brain dictate her lines. Later, her assistants strip the surface from excess wood according to her markings, letting the form hidden beneath appear in wave-like fluidity. Although she is strictly meticulous with each step, the result is barely premeditated. 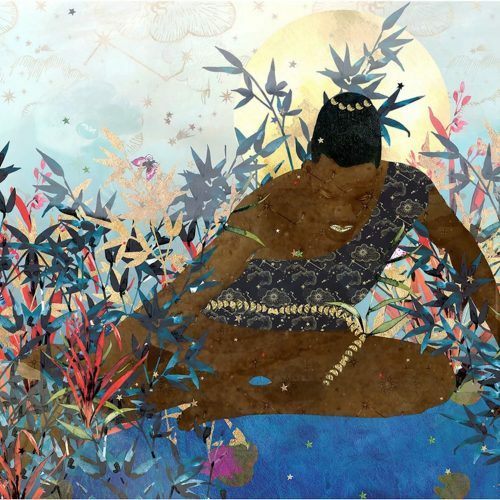 The true resonance of the work stems from such unpredictability and submission to wonders of the material. Oziksien, 2016. 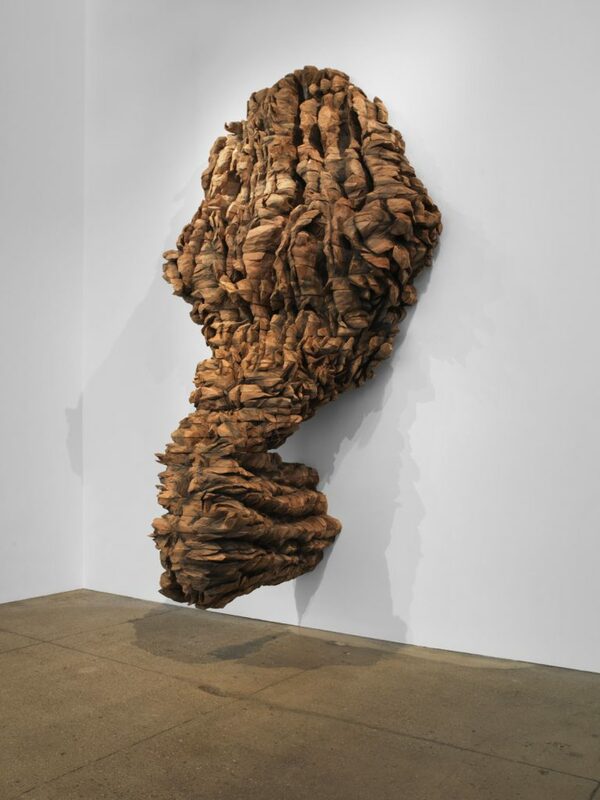 Photo: Michael Bodycomb; Courtesy of Ursula von Rydingsvard and Galerie Lelong & Co. The energetic artist, who is noticeably hands-on with day-to-day operations at her studio, suggests a small demonstration of her technique on a sculpture in early-stage positioned next to a forklift gifted by her husband. 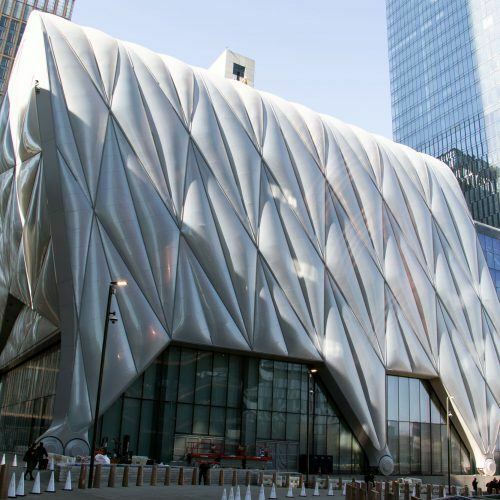 Judging by the soaring heights of her sculptures, the vehicle is a crucial one to assemble works that the artist often times creates in several sections. Book with no words, 2018. 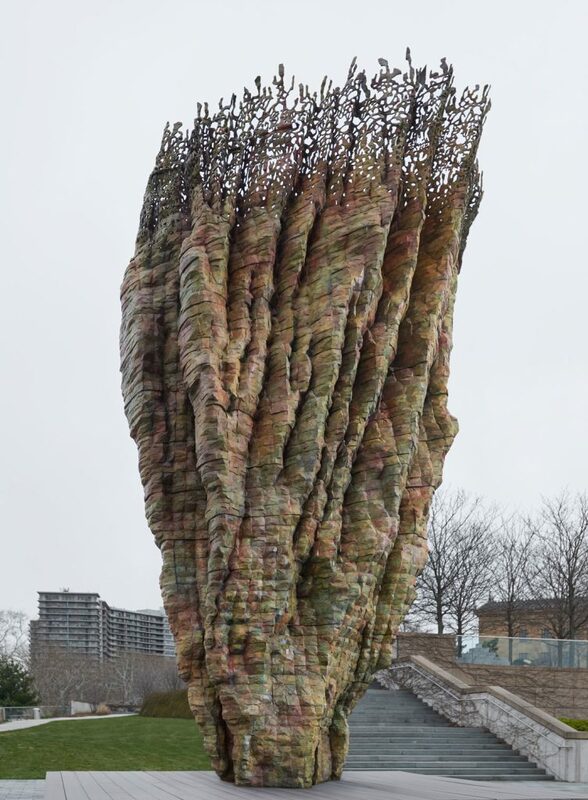 Photo: Courtesy of Ursula von Rydingsvard and Galerie Lelong & Co.
Two outdoor sculptures at the Philadelphia Museum of Art’s Sculpture Garden demonstrate the marrying of cedar with bronze or urethane resin at monumental scale. 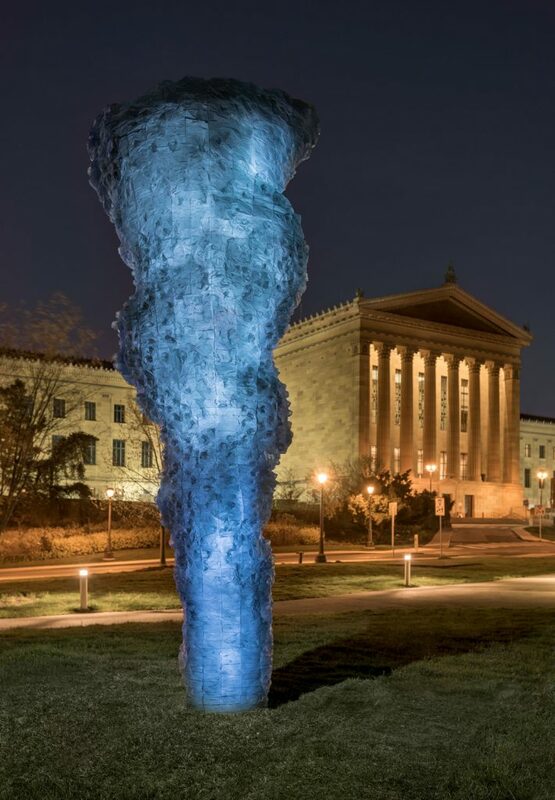 In Elegantka II (2013-14), a tornado-like resin formation appears in blue hues, adding aquatic accents to its kinetic energy. Bronze Bowl with Lace (2013-14) does justice to its title and introduces lace-like elaborate patterns around its peak. A half-hour walk from the museum, “The Contour of Feeling” at Fabric Workshop and Museum introduces close to twenty works the artist has created since 2000, including those making their U.S. debut. The scene-stealer in this presentation is PODERWAĆ (2017), a mixed-media hanging sculpture primarily in leather with elements of steel, cotton, and polyester. 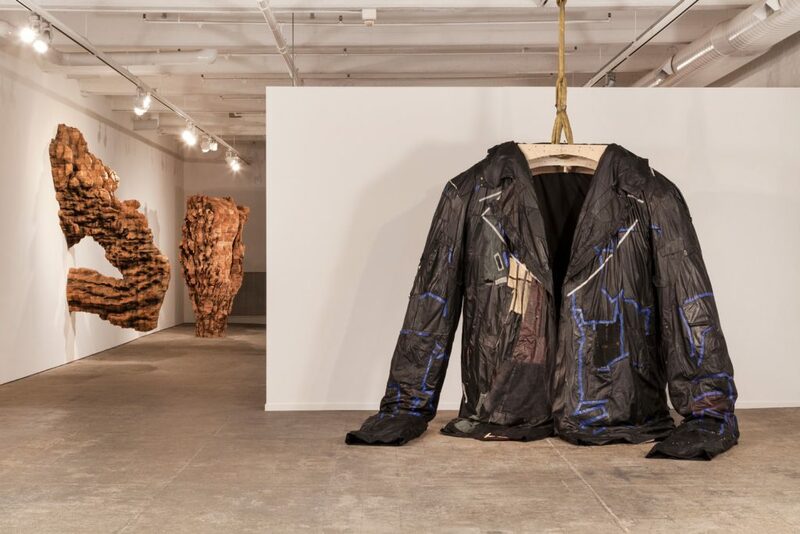 Aside from spearheading the exhibition as a collaboration between The Fabric Workshop and the artist, the jacket-shaped sculpture strikes out as being a candid, and humorous, representational work amongst abundance of abstraction, hinting the experimental soul the artist has maintained over decades. 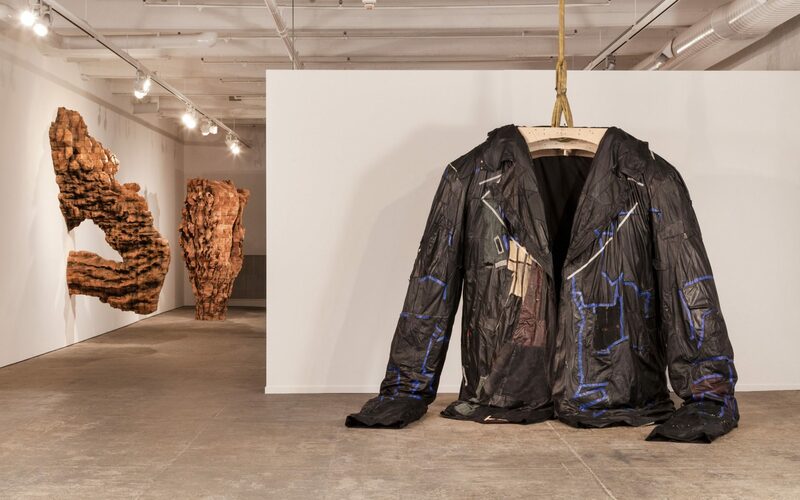 “Ursula von Rydingsvard: The Contour of Feeling” is open at the Fabric Workshop and Museum until August 26, 2018. “Now, She: Two Sculptures by Ursula von Rydingsvard” is open to public at the Philadelphia Museum of Art until April 28, 2019.